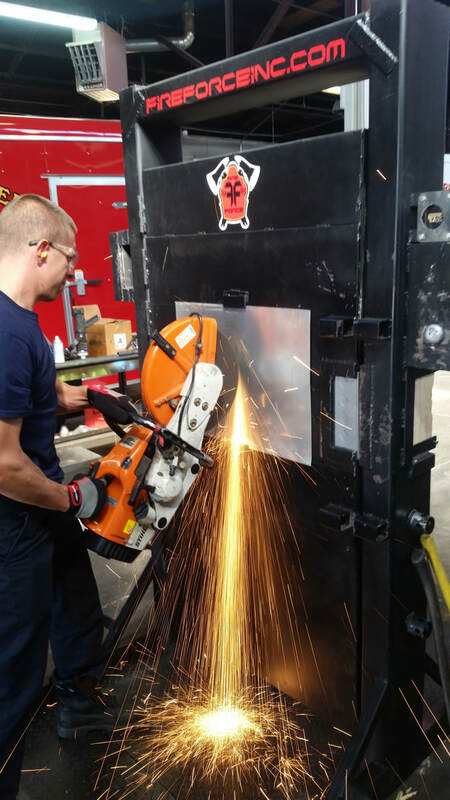 Forcible Entry Simulators - Fire Force Inc.
Our "Gap Blocks" create the most realistic training experience for conventional forcible entry. These gap blocks come in 3 levels of crush that replicate residential & commercial application thus creating a sacrificial section of a door that enforces proper tactics for GAP/SET/FORCE methodology. Unlike spring loaded training doors that don't feel realistic and cannot actually gap...our door simulator feels like forcing an actual door every force! The Panic Bar Cut Through System provides the ability to plunge cut through our sacrificial panels on the door. These cutting tactics allow access to the commercial panic bar mounted on the inswing side of the door. The Drop Arm Breaching System allows the user to create an actual drop arm that must be breached. Our door is fabricated with a window in the middle of the door with tracks on the outswing & inswing sides. Simply slide sheet metal panels into the tracks, drill and mount the drop arm brackets through the panels using carriage bolts and slide in the 2x4 and now you have a commercial outswing door with a drop arm...its that easy! This simple feature provides the ability to create a sacrificial wood jam for baseball swing forcing tactics. Unlike the competition...no need to drill and bolt our setup...simply slide in a piece of precut plywood into the holder and shut the door...its that easy! Our innovative wheel system allows the simulator to be rolled through a bay or out to training grounds by ONE person! Large airless swivel tires make the unit capable of setup in gravel. The wheel system removes by quick pins. Our simulator provides the ability to pull hinges using actual hinge screws making it much more realistic than bolt tension resistance. Cutting the hinges is also possible with this feature. The Deadbolt Cutting System provides the ability to simulate cutting a deadbolt between the door & jam. We use rebar placed inside an internal track as a cheap sacrificial material to replicate this tactic. Our Lock Pulling System produces a realistic method of simulating pulling lock cylinders as well as limiting setup time and materials. Place our custom fabricated hardened steel lock heads through the pry zone and hand tighten a large washer and nut to the back. You are now ready to train....the washer serves as the resistance and bends through the pry zone. The unit comes with a large residential style lock and a small commercial style to be used with a K Tool or R Tool. Our Through The Lock System offers one of the most common residential deadbolts that may need internally operated. This lock is bolted on so it can be changed out for various locks.